We have posted a series of blogs on big cities and their dessert choices. Now we’re honing in on smaller locales, such as Key West, Florida. Key West is renowned, of course, for its rich and creamy Key Lime Pie, the official dessert of Key West and Florida’s official pie. As with many notable desserts, Key Lime Pie has somewhat murky origins. We do know that when locals began whipping up the sweet treat, probably in the 1850s, fresh milk was hard to come by in that area of the country. So canned milk was shipped in and used in lieu of fresh milk. Traditional Key Lime Pie was not cooked, as the acidity of the limes would curdle the condensed milk. Today’s Key West locals, known as “conchs,” still adhere to the use of sweetened condensed milk for Key Lime Pie, though it’s usually baked today. True Key Lime Pie is not green, but a creamy yellow as a result of the egg yolks in the recipe and relies on small Key limes verses the typical Persian limes found in most grocery stores. 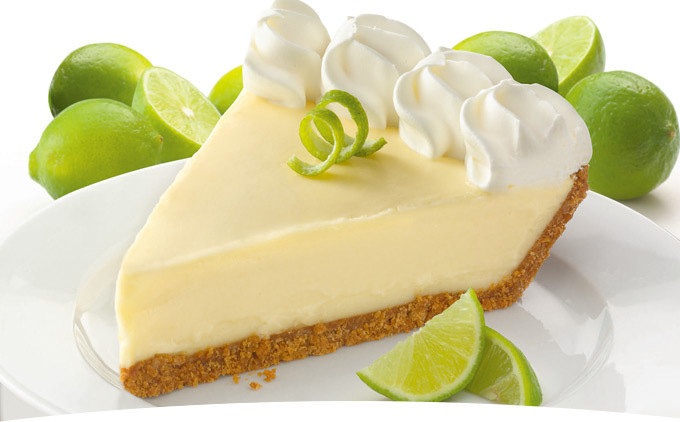 The crust was typically a pastry crust, but many of today’s Key Lime Pies rest on a graham cracker crust instead. Key lime will never let you down, so don’t limit yourself to the conventional pie. Try Key lime pie squares, Key Lime Pie cupcakes, Key lime coconut cakes, Key lime bites or Key lime tartlets. Top with meringue or whipped cream. You can even use regular limes if you want to—we won’t tell. Just get baking!